There is a family story that the Baker family, headed by my great-grandfather William Henry Baker, had originally planned to come to the United States on the Titanic, but had changed their plans and come on different ship. While I don’t have any documentation of that, I believe it to be true, since my grandfather, Idris Baker, told me about it several times. He should have known whether it happened or not, because he was there; he was about 8 years old when the family made the trip. I remember that, when the Titanic was found in 1985, he was very excited and told us all about it again. There wasn’t that much to his story, just that they were planning to take the Titanic but took a different ship instead. He didn’t remember which ship they had taken or why they had made the change. At the time the Titanic was found, Idris was the last surviving member of the family that had made the trip. He passed away in 1987. I did some research into this a few years ago and found the the family arrived on the RMS Baltic (pictured above,) which was owned by the White Star Line, the same company that owned the RMS Titanic. 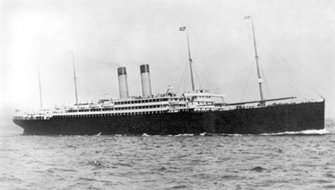 The Baltic sailed from Liverpool on February 1st, 1912, arriving in New York on February 12th. The Baltic left more than a month before the Titanic, and perhaps the family was just offered the opportunity to leave earlier and took it. Interestingly, according to www.titanic-titanic.com, the Baltic sent an ice warning to the Titanic on April 14th, 1912 during its return trip. The whole Baker family made the trip, except daughter Mabel, who actually made the trip more than year earlier on the RMS Lusitania, the same ship famously sunk by the Germans during World War I. The sinking of the Lusitania shifted public opinion in the US, and was one of the events leading to the US entering the war. Mabel was 18 when she made that trip. The family settled in Penn Yan, NY, near members of the Knapton family. William’s wife was Elizabeth Anne Knapton. Sadly, Willam died on July 2nd, 1913 in an accident at the factory where he worked. I have no information on the Bakers prior to William. Although the family was living in Pentre, Wales just before leaving for the US, William appears to have been born in Somerset, England in 1862. That date and location came from the Baker Family Bible. I have found no further documentation of this. My aunt, Joan Baker, told me that William had been adopted, but I have never found any record of his parents, adopted or natural. The Knaptons, however, were definitely from Somerset. I have quite a bit of information on that family. So, is the story about the Titanic true? I think so, but will probably never be able to prove it. In any case, it makes for an interesting story.